Diamond Tile Cutting Wheel Diamond coated to cut through tough materials and leave a clean finish. 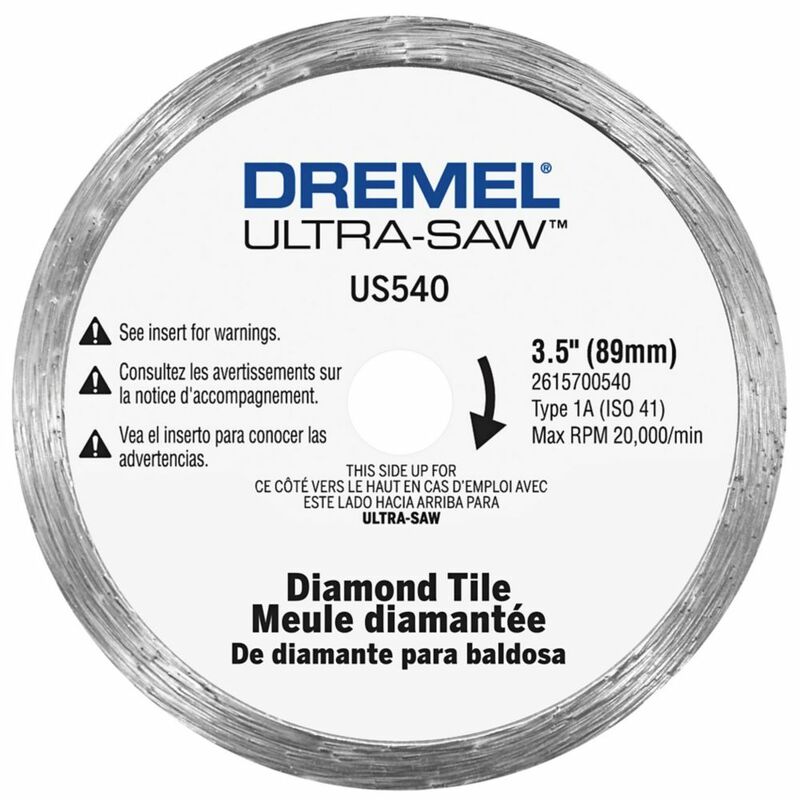 The US540 tile wheel cuts most tiles and masonry materials with ease and precision and no water needed. This 3.5 diamond wheel cuts a variety of tile including wall tile, floor tile, porcelain, slate, stone, and cement backer board. May also be used as a fast way to remove grout. Diamond Tile Cutting Wheel is rated 4.5 out of 5 by 55. Rated 1 out of 5 by HomeDepotCustomer from Did not cut as well as the dull Rigid blade... Did not cut as well as the dull Rigid blade I was replacing. Rated 5 out of 5 by Butch from I love my Drexel.... I love my Drexel. Rated 5 out of 5 by Gman from Used this with my Dremel US40 saw. I wish it was included as one of my accessories. It cuts cera... Used this with my Dremel US40 saw. I wish it was included as one of my accessories. It cuts ceramic tile cleanly. I used it to remove part of my backsplash to install a new over-the-stove microwave.. Rated 5 out of 5 by Mark from Awesome!... Awesome! Rated 5 out of 5 by EdL from The blade performed well with the ceramic tile I was... The blade performed well with the ceramic tile I was working with. Rated 5 out of 5 by Anonymous from Worked great to cut porcelain tile, but because of the... Worked great to cut porcelain tile, but because of the wheels thickness, I had to add 1/8 to my measurement otherwise it kept cutting too short. Rated 5 out of 5 by HomeDepotCustomer from Yes, it an awesome tool.... Yes, it an awesome tool.